1. Rates are not included breakfast. 2. Check in time after 14:00(noon) or earlier upon room available. Check out late: Any extension after 12:00 noon will be levied at 50% of regular rate. Extension after 16:00 will be charged at one night room rate. 3. The balance must be paid upon check-in. Hotel requires guest to provide a security deposit THB 1,000 at check-in by cash to guarantee payment of any incidental charges, and it will be returned when check out. 4. There is no room charge for a child under 6 years old, (Maximum 1 child) staying with parent and using an existing beds. Children over 6 years old is considered and charged as adult. 5. Extra bed is not available. Ideally located a few minutes walk from the world famous Khao San Road and Thailand's leading historical sites, places of tourism called 'Rattanakosin Island'. 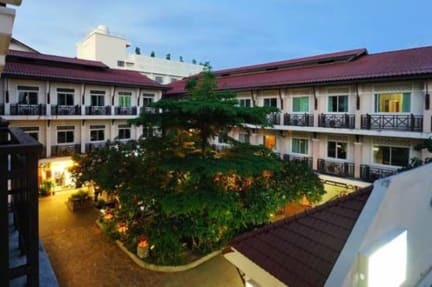 Rambuttri Village Inn offers it's guests a superb location whether your pleasure be shopping, entertaining, dinning or simply exploring Bangkok. One of the latest and most beautiful hotels in this area, Rambuttri Village Inn has and enviable modern Oriental-style architecture and landscaped garden. Our guest will enjoy staying in resort style hotel at budget price. Rambuttri Village Inn offers clean and comfortable accommodations, Boutique style decorated rooms are generally equiped with air-conditioning, hot shower, desk, cable TV, in room safe box, hair dryer, complimentary water and bathroom amenities. All rooms have windows and private bathrooms. Deluxe Rooms are generally featured with DVD player, in room safety box, hair dryer, refrigerator and window with garden view**. 3. The balance must be paid upon check-in . Hotel requires guest to provide a security deposit THB 1,000 at check-in by cash to guarantee payment of any incidental charges, and it will be returned when check out. I can’t think of a better location to enjoy the nightlife of Bangkok! Rambuttri Village and Plaza is right in the middle of it all and I would rebook this beautiful facility in a heartbeat!! This hotel is clean, fun, conveniently located to everything and has great staff! Clean, comfortable, great pools and fantastic location! clean, cold AC, great location, nice pool. a little on the expensive side. This place is a hotel rather than a hostel, so as a solo traveller it wasn't great for meeting people. The room was clean and had more facilities than I expected, including a safe and a hairdryer. I slept like a baby because although you're close to Khao San Road, the noise didn't reach the room. When I was awake I heard a lot of noise from within the hotel - the walls are thin. Breakfast is good but overpriced. I saw afterwards it is cheaper to book throùgh other sites, not website. Clean and comfortable, excellent location. Walls are paper thin so you can hear the staff and other guests in the hallway and the rooms. There also seems to be a mosque nearby as you can hear the first call to prayer at 5am. Two rooftop pools are great. Not as easy to meet people as in a hostel. Would stay again, mostly because of the location, the pools and the cleanliness. Great location and good price. But staff were initially rude and didn't direct us to the right room and we ended up knocking someone elses room- before asking again where it was but they were reluctant to show us and found it funny. As we had just been travelling all day we just wanted to get to the room. Also ripped us off at the reception for a taxi to the airport if you walk further along there are loads of taxis for half the price! It's really loud between the bathrooms venting directly into the hallway and the partying going on in the neighborhood, so I wouldn't recommend it if you're a light sleeper or will be getting up early, but if you're staying in this neighborhood I'm sure you're expecting some noise. It's really close to the pier which is great if you're catching the boat taxis and the pool is a great perk. Rooms are not very clean, arrived and my bathroom had not been properly cleaned— nothing horrifying though and no bugs in sight. Bed was comfortable. Walls are paper thin. Light comes through a vent in the bathroom through glass tiles into the bedroom. Was awoken to things flying across my bed — thought it might be bugs but it was ice chunks and water spitting out across the bed wtf. Definitely a party area but you are off the Main Street so you’re far enough away from the party noise.